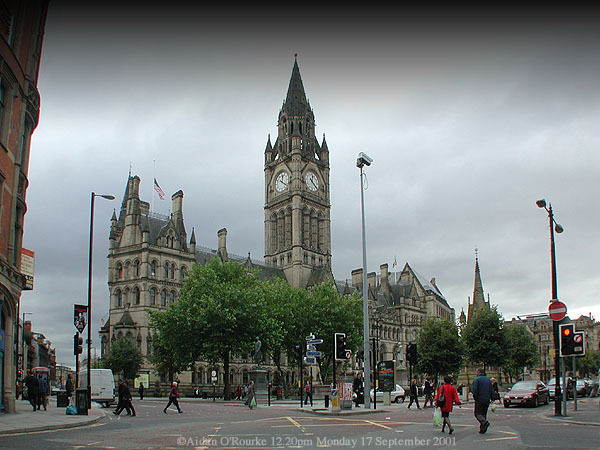 Manchester's magnificent Town Hall can be found in Albert Square, just to the north of St Peter's Square. The huge Victorian building dates from the 1870s and is a testament to Manchester's wealth and prominence in its heyday. 300ft high the tower is a distinctive landmark that dominates the city skyline. The interior is equally splendid with ornate Baroque decorations everywhere. Of particular note is the hammer-beam roof in the Great Hall, which contains 12 murals by the pre-Raphaelite artist Ford Madox Brown and the organ orginaly built by Aristide Cavaillé-Coll in1877. The Town Hall is open to the public from 9am to 5pm Mondays to Fridays, but if meetings are in progress some areas might be restricted. Admission is free. Guided tours are sometimes available at a cost of around £3 for adults.